If you have read my books or been a regular here on my site you know I love the history of pro wrestling in my home area. You also know that I grew up a super fan of the sport that became my profession. 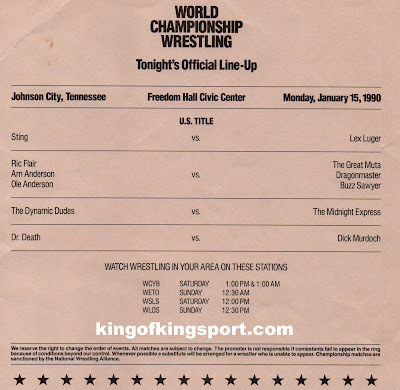 I have a couple of blogs about big events promoted by Jim Crockett Promotions at Freedom Hall in Johnson City, TN. I want to take a look at a down time today to tell you about some of the lowest points for wrestling in the area and the match that turned it around. 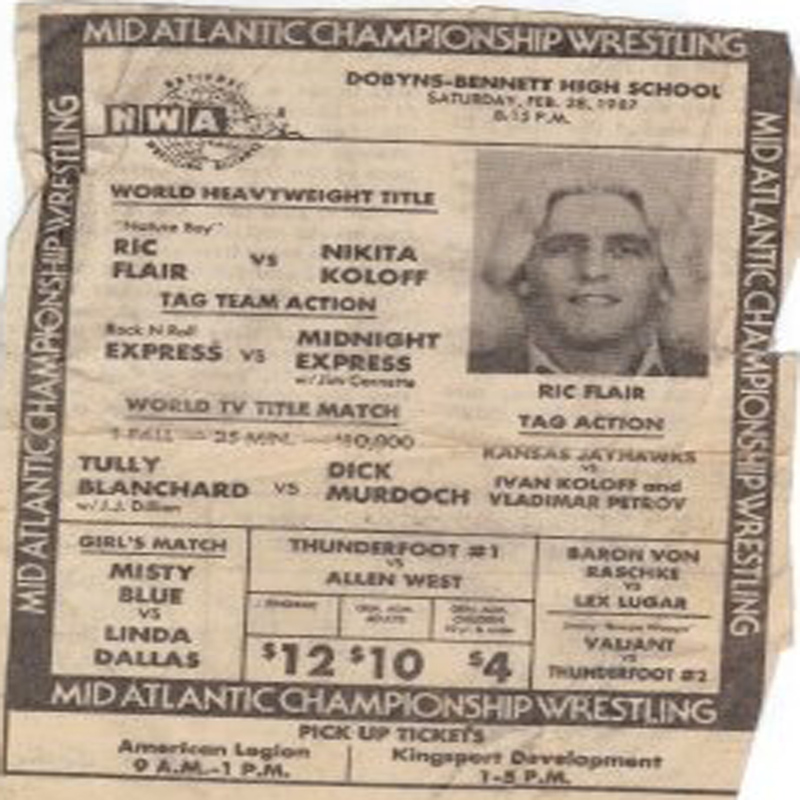 When I started going to the wrestling matches in the fall of 1982 Dobynss Bennett High School was the regular stop for Crockett's Mid Atlantic Wrestling. The matches were held mostly on Sunday afternoons with a Friday night card here and there. In 1985 the regular events in Kingsport stopped. Johnson City's Freedom Hall became the regular stop for JCP. Johnson City would run on either Wednesday nights or Sunday afternoons. 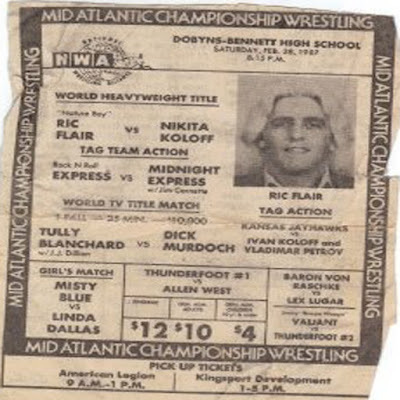 I was told once by Sandy Scott that Dusty Rhodes was behind the change from Kingsport to Johnson City because he thought Freedom Hall sound better on TV over a high school gym. Even though the gym is a 6000 seat Dome it's self. Crockett with Dusty at the head as booker and TV producer was trying to make a National Expansion. The first Johnson City sell out came on January 24, 1986 headlined by Dusty Rhodes vs. NWA World Champion Ric Flair. The rest of 1986 would be a great year for Johnson City with another sell out with higher ticket prices in July and several other cards drawing at least 3/4 of a full house. 1987 would continue on with business as usual with great cards and very good attendance for Johnson City. 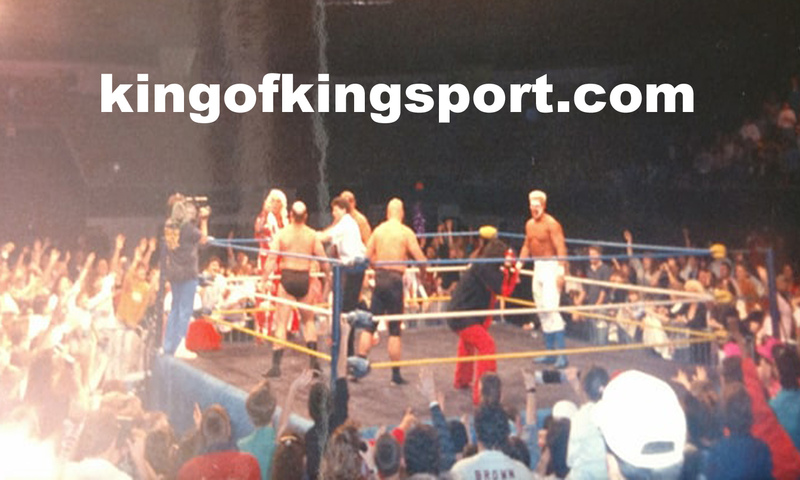 They also made a return to Kingsport setting an all time record that still stands to this day. I'll have a blog about that in February. By late 1987 business had started to take a dip a bit but Johnson City drew a crowd over half the building Thanksgiving night to watch Starrcade by closed circuit TV on a large screen. 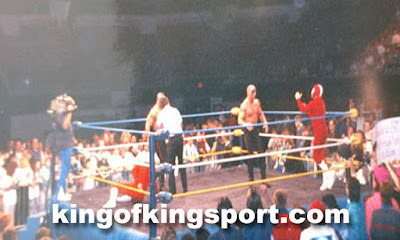 The first event of 1988 in Johnson City was headlined by Sting vs. World Champion Ric Flair on February 10, drawing in the 3, 500 range. 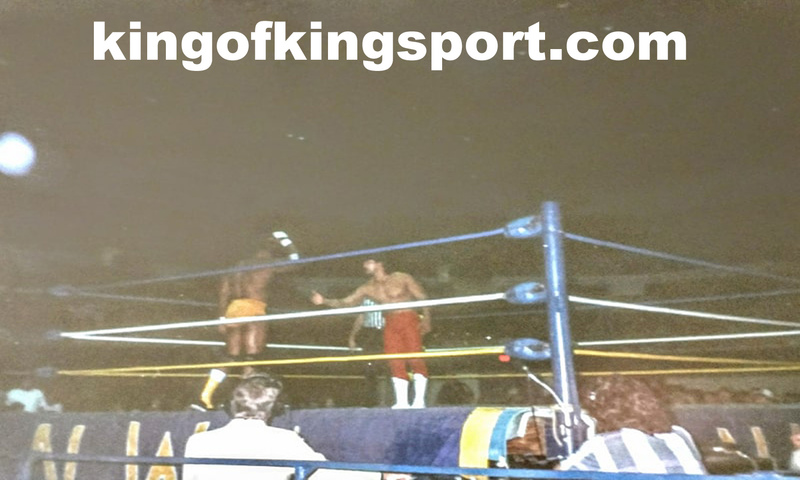 The next event in the Tri-Cities came on Sunday March 6,1988 back in Kingsport, TN at Dobyns-Bennett High School. Drawing in the 1200 range. 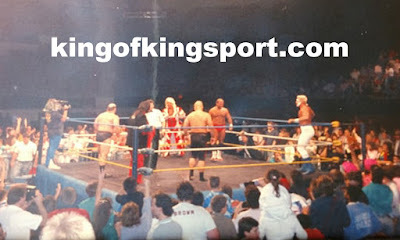 Even though we got The Road Warriors, Midnight express and long time area favorites Ronnie Garvin and Jimmy Valiant it was not the usual card Tri- Cities fans had became use to. By late 1987 Crockett's focus had turned to TV. 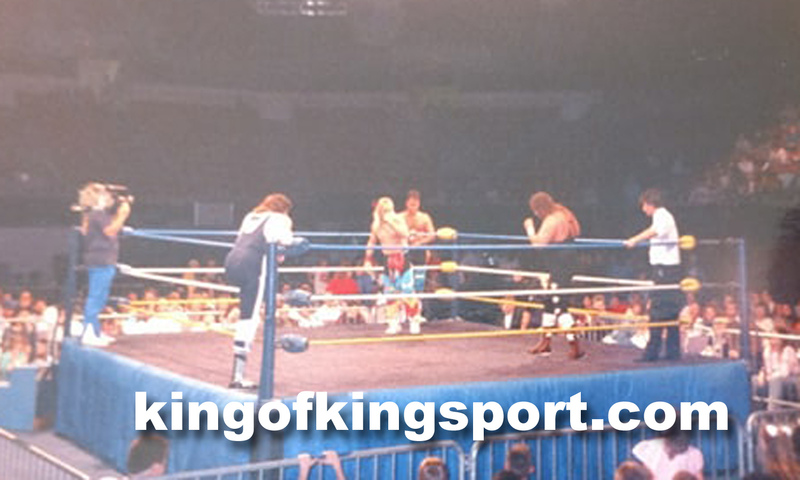 They had bought Kansas City, Florida and The UWF. So they could take their TV spots and ad to their syndication. They had created The Wrestling Network and were going after National Ad Revenue. 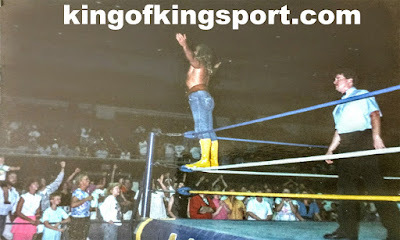 Jim Crockett JR. has stated they just started looking at arenas as large TV studios. This put the company in major financial troubles as it took time for the ad money to come in. They also had been blocked on many cable companies from carrying their Pay Per Views by a power play from the WWF. It seemed fans were excited that a TV Taping was coming. About a week out I heard people saying it was sold out. They said they had called the box office for tickets but were told it was a sell out. I went to the event with my Dad and Uncle and we left early because we had been caught in the lines for a sell out before. As we pulled in we could not believe it. Very few cards and no one was in line. As we went in we where wondering where is everyone? Turns out all the tickets were sold that were available. They only sold 500 seats. The blacked out the building, used camera angles, and TV lights to make it look like it was much more. They had in fact turned an arena into a TV studio. They taped two hours (NWA Pro and World Wide Wrestling) of TV that would air on July 2. The only thing of any interest that came out of the two hours was the debut of The Russian Assassin and Nikita Koloff saving local Police Officer/Wrestler Kim Birchfield from Al Perez. This is an arena us to hot feuds, World Title Matches, blood baths, and action. That Sunday was a disappointment for everyone their. People wanted and expected more. It did not help that one of if not the most exciting weekly TVs was being produced in near by Knoxville by Ron Fuller at the times. The wrestling fans there also had been promised three Main Events and only got two of the three. The two that we did get were short and did not give a true out come. The Road Warriors defeated NWA Tag Team Champions Arn Anderson & Tully Blanchard via disqualification. Lex Luger fought NWA US Champion Barry Windham (w/ JJ Dillon) to a double count-out. Here are the two hours of TV taped that day. In July the NWA returns to Johnson City for the 4th Annual Great American Bash Tour. Head lined by War Games. 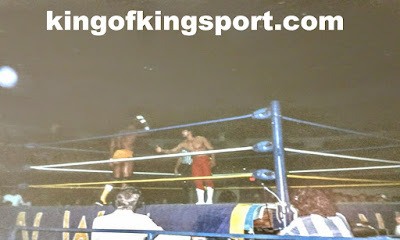 Even the Two Rings covered by a cage could not get the bad taste out of some people's mouth as the event did not draw what the Bash had in years past in Johnson City. By the time that the NWA returns to Johnson City for the last appearance of 1988 Crockett had been force to sell his Family's company to Ted Turner. The last card that year was November 6 drewing in the 1500 range. 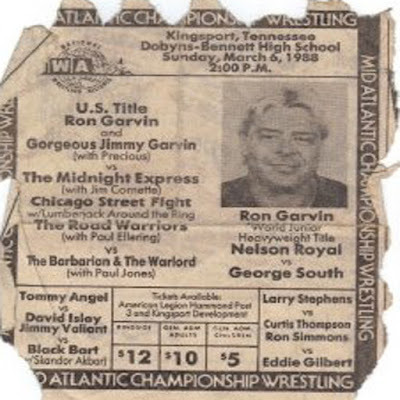 The next card in Freedom Hall was February 3, 1989 with the house back up around 2500-3000 range but the card was a mess with no shows, card changes, and sound system troubles. It was a five match card and a Bunkhouse Stampede. Out of the five matches one advertised match happened. Junkyard Dog and Micheal Hayes vs. Original Midnight Express with Paul E.
As 1989 went on it got worse. The lowest point came with a card on April 25th that drew in the 300 range. The people you see in the pictures is pretty much what was there. Lance Russell was there doing live commentary of the event on The WCW Hotline. That was the first time I met Mr. Russell. 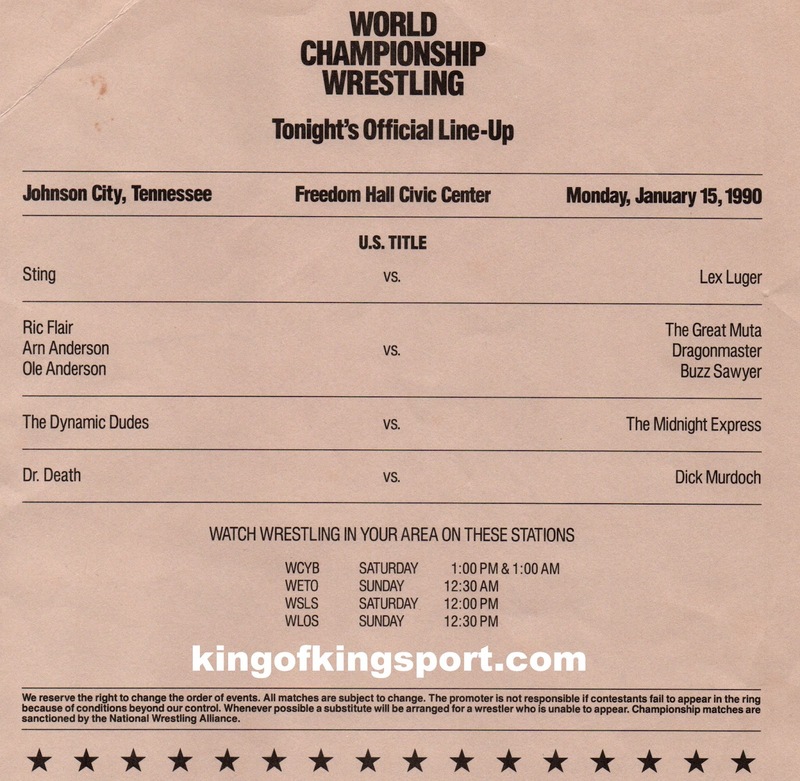 For the first time since they started the tour Johnson City did not get an Great American Bash card in 1989. It seemed that wrestling was as we knew it had ended in our region. The NWA would make a return for this card on October 18 1989 drawing in the 500 range. They announced a return date that night of January 15 1990. Which was strange because they had stopped announcing return dates in house once the Kingsport to Johnson City moved happened. They would just tell you to watch TV and look for announcements in the paper. They also announced that it was the biggest card in Johnson City in a long time. They also announce a card coming to Bristol in December. The card that came to Bristol was another TV Taping. This time there was no limit on ticket sells and it drew in the 1500 range. Unlike the one a year and a half before the Bristol card was three hours of taping but they did have some pretty good dark matches. The high light of the Bristol Taping was a surprise return of The Minnesota Wrecking Crew Ole and Arn Anderson. Through out the night the kept plugging Johnson City. The only change in the advertise matches was Sid was out for an injury so the Skyscrapers vs. Road Warriors turned into Hawk vs. Dan Spivey. Also Eddie Gilbert and Kevin Sullivan had a classic Tennessee brawl in a dark match. 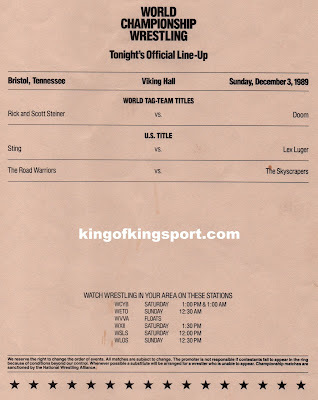 And they did a in house return for Sting vs. Luger in Johnson City in January. They never did in house to set up anything before always on TV. They had made they upcoming January event seem way different then anything before. I've told you all of this to lead up to 28 years ago tonight. They had advertisement on TV starting the week after Bristol event on January 15th. The event was never called a TV Taping and no mention of the matches to be taped in any advertisement that I can remember. Thanks to Ron West who I sold merchandise and set the ring up for with Continental Wrestling. My oldest sister Mia and I had ringside seats. As we went in the first thing you noticed was the TV Lights, Cameras, and an interview stage at the back of Freedom Hall. The event did not draw like the events of years past but it was the best house in Johnson City since Bash 88. The upper balcony had to be opened. Once again the lights and camera made it look a lot better. This also was the hottest crowd the Tri-Cites had had in a long while. They taped three hours of TV then had The Sting vs. Luger Dark Match. The match that everyone was talking about the next day was a Six Man Tag of Sting (Sub for Ole), Arn Anderson, and Ric Flair vs. Buzz Sawyer, The Great Muta, and The Dragon Master. The card also featured The return of The Rock N Roll Express to the Tri-Cities. and Cactus Jack (Mick Foley) NWA Tri-Cities debut. The matches would not air for almost two weeks on January 26 and 27. That following weekend it seemed like everyone was a wrestling fan. When I went to school on Monday people who never mentioned wrestling were talking about watching The Power Hour and the six man tag. The crowds did not get back to sell outs and near sell outs until the Monday Night Wars but they did come back up. Jim Cornette would make Johnson City a monthly stop for Smoky Mountain Wrestling in the early 90s. 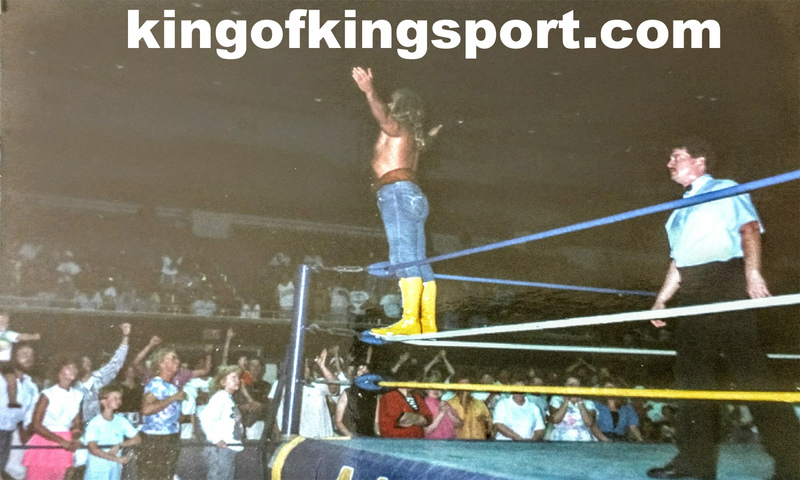 It seemed a new life was breathed back into wrestling and new fans were made on that cold Monday January Night. As the NWA changed to WCW they continued to make stops in the Tri-Cities and doing TV in Johnson City including a WCW Monday Nitro. 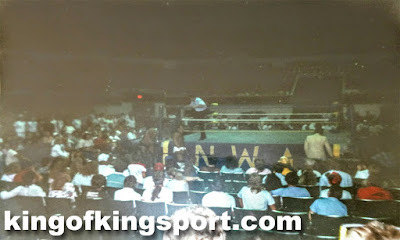 WCW would bring regular live events to the area up into months before they closed. I hope you have enjoyed my walk through fandom memories. 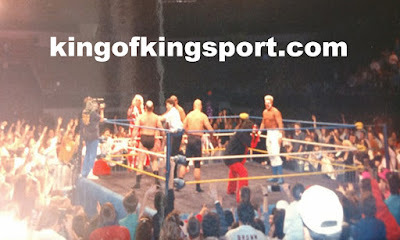 My in ring career started shortly after this event. Which ended me going to wrestling events as a fan. If anyone has the taping from Bristol on video please let me know. 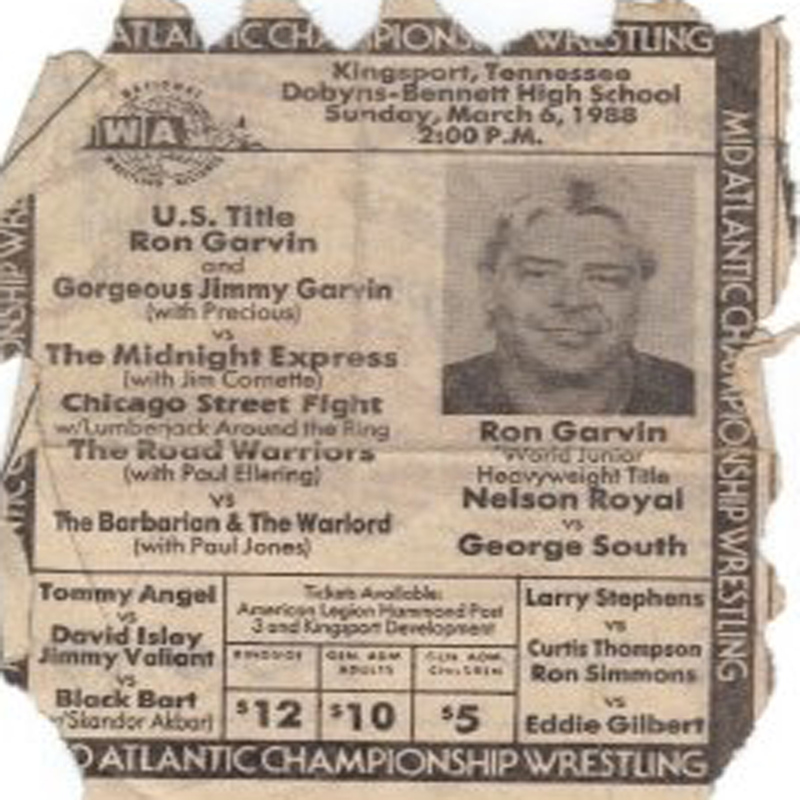 I'm also looking for the NWA pro and Worldwide Wrestling that were taped in Johnson City January 1990. Awesome! Very enjoyable reading for a fan of 80's wrestling! Thank you and God bless!